Absence Seizure: Also called a Petit Mal Seizure. A seizure of such brief duration that it is difficult to recognize. 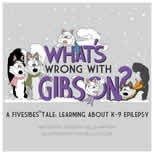 According to who you talk to, absence seizures are either very rare in dogs or unrecognized. AED: Anti-epileptic drug. Also called anticonvulsant or antiseizure drugs. Examples would be phenobarbital and potassium bromide. Allopathy: The traditional approach to treatment that most veterinarians practice; treating the disease by supressing its symptoms or attempting to destroy the microbes associated with the condition; the opposite of homeopathy. Sometimes called the Western approach. Ataxia: Uncoordination that is caused by temporary or permanent neurological impairment. A side-effect of some AEDs that can diminish with time. Aura: A sensation or warning that a seizure is about to occur. See Pre-ictal. BID: Giving medication twice per day. Example: 30 mg BID means that 60 mg is given a day. cc: Cubic centimeter. Same as a millileter (ml). Clonic: Movements during a generalized seizure which includes paddling and/or chewing. Cluster Seizures: More than 1 seizure in a 24 hour period. Complex Partial Seizure: Seizures that are associated with bizarre or complex behaviors that are repeated during each seizure. These behaviors can last for minutes or hours and can also be followed by a generalized seizure. Thought to be associated with Secondary Epilepsy. Efficacy: Effectiveness. Usually refers to the effectiveness of an AED in controlling seizures. Epilepsy: Refers to recurrent seizures that have a specific neural origin in the cerebral cortex. Focal Seizures. Also called partial seizures. These seizures affect a part of the brain and thus just a part of the body -- like the flicking of an ear. Focal seizures are more likely from secondary epilepsy than primary. Generalized Seizure: Also called Tonic-Clonic seizures. If the whole brain is involved in the seizure, it is a generalized seizure. Can be Grand Mal or Mild, but are usually associated with primary epilepsy. See Clonic and Tonic. Grain: 64.798918 mg. Sometimes referred to as 60 mg, 62 mg, 64 mg or 65 mg. The term comes from the weight of a grain of wheat. Grand Mal Seizure: Also called Tonic-Clonic. This is a generalized seizure, associated with primary (idiopathic) epilepsy. Half-Life: The time that it takes for one half of the original concentration of a given drug to dissipate through the body. The shorter the half-life of a drug, the more frequently you have to administer the drug. KBr: Potassium Bromide. An AED. Kindling: A process where having repetitive seizures lowers the threshold for having more seizures. This is one reason for getting early control of the seizures. Holistic: The approach of taking into consideration the whole body and environment when offering treatment. Sometimes called the Eastern approach. Homeopathy: A system of medical treatments based on the theory that certain diseases can be cured by stimulating the body's own defenses against the illness; the opposite of allopathy. Ictus (Ictal): The actual seizure. Idiopathic Epilepsy: Seizures for which there is no known cause. Also called primary, inherited, genetic or true epilepsy. Inter-ictal: The time period between seizures. Levels: This refers to the results from monitoring the AED serum concentration in the blood. Also called blood levels, serum levels. See Trough and Peak levels. Mirroring: A process where seizures which start on only one side of the brain can in time 'mirror' themselves on the other side of the brain thus increase the frequency of the seizures. This is one reason for obtaining early control of the seizures. ml: Milliliter. Same as a cc (cubic centimeter). NaBr: Sodium bromide. An AED. Nonepileptic Seizures: Seizures that can be identified as either nonneurogenic (ie:cardiac, metablic disturbances, recurrent abdominal problems) and neurogenic (ie: narcolpesy, vestibular disease, myasthenia gravis) in origin. Partial Seizure: See Focal seizure. Peak Level: Either the results from or the testing of the AED blood serum values when it is at its highest in the dog's blood. This value is of concern where toxicity might be an issue. For PB levels, the peak is taken 4-6 hours after PB dosing. Giving the PB with food can add another 2 hours to the peak time. Petit-Mal Seizure: See Absence Seizure. Polydipsia: excessive thirst - a possible side effect of being on some AEDs. Polyphagia: excessive hunger - a possible side effect of being on some AEDs. Polyuria: excessive urination - possible side effect of being on some AEDs. Post-ictal: The period after a seizure. Can last for minutes or days. The dog can be temporiarily blind, restless, confused, disoriented, confused. Sometimes this is the only indication that the dog has had a seizure. Pre-ictal: The period prior to the start of the seizure. Sometimes called aura. Some of the signs are restlessness, nervousness, whining, trembling, salivation, affection, wandering, hiding, hysterical running and apprehension. Primary Epilepsy: See Idiopathic Epilepsy. Also known as genetic, inherited or true epilepsy. Prodrome: The period (hours to days) before a seizure. Extra AEDs given during this period might help reduce the severity of the seizure or eliminate it. Rescue Remedy: A homeopathic remedy from Bach Flower Essences (available at most Health Food Stores) that can help lessen the effects during the post-ictal or the actual seizure if given during the pre-ital period. No scientific studies have been done on this, however for many it DOES work . Secondary Epilepsy: Epilepsy for which a cause can be determined. Usually found in dogs under 1 year of age and over 5 years of age. Seizure: Also called convulsion, ictus, fit. The brain cells work together, communicating by means of electrical signals. When there is an abnormal electrical discharge from a group of cells, the result is a seizure. Seizures are either epileptic or nonepileptic. Seizure Threshold: The level at which dogs will have a seizure. It is suggested that this level is inherited. Lowering the threshold (though drugs like acepromazine, or through kindling), makes seizures more likely to occur. Raising the threshold (using drugs like phenobarbital or KBr) will make seizures less likely to occur. Status: Status epilepticus is defined as more than 30 minutes of (1) continuous seizure activity or (2) two or more sequential seizures without full recovery between seizures. More than 3 major seizures within a 24 hour period should be considered a serious condition that may evolve into status and should be treated. The 30 minute duration in the above definition was chosen because detrimental effects begin to occur after this time. These effects include systemic effects such as abnormal breathing, blood pressure and heart rate, and blood glucose, in addition to body temperature. Also, prolonged abnormal electrical activity within the brain can cause persistent brain damage. These changes tend to be reversible during the 30 to 60 minute period of continuous seizure activity but after 60 minutes, death of nerve cells occurs. TID: Giving medication three times per day. Example: 30 mg TID would be giving a total of 90 mg a day. Tonic: The phase of a generalized seizure where the dog falls, loses consciousness and extends its legs rigidly. In a mild generalized seizure, the dog may not lose consciousness and could have little or no extension of the legs. Tonic- Clonic: See Generalized Seizure. Trough Level: Either the results from,or the testing of the AED blood serum values just before the next medication dosage is given. It is at this time that the AED is at its lowest level in the blood.